← Let’s Make Some Rows! I’ll make this quick since it’s time to pack up the Michigan house and move back to Boise. 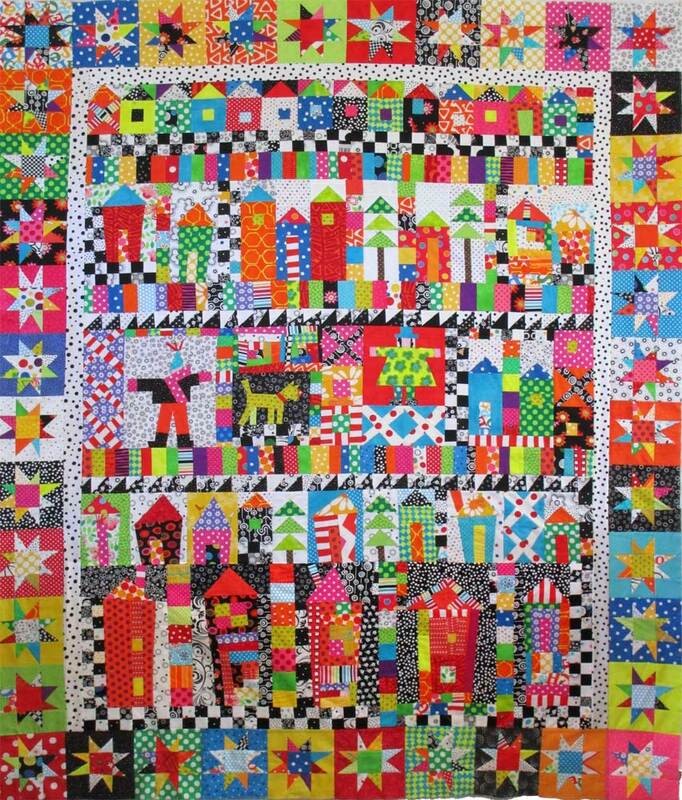 It must be time…I’ve finished the wonky houses quilt top late last night. I know, I know, it’s not a quilt until it’s quilted, which is all the more reason to pack up and return to Boise! I hope you like it and have had a little fun following along. Thanks for providing me an opportunity to put a little color into your day. This entry was posted in "Whatcha doin'? ", Liberated Sewing and tagged liberated quilting, sewing, wonky quilts. Bookmark the permalink. So enjoy wonky and color in quilts. Love it. Will be fun to see it quilted. Your quilt is totally and completely awesome!!! Love the color! Love the fun! Love the freedom to play! Fantastic! This looks terrific! Love that you could add color to your otherwise gray Michigan days! Wow beautiful – where did you find this pattern? Thanks, Bev (and everyone else who has commented)! There isn’t a pattern, I just made it up as I went along. The only tricky part is making everything fit in the end. And that’s not much of a trick–take in some seams, cut some off or sew some more on. So colorful! Makes me happy. I thought maybe you were doing the houses for the Row By Row? Hint, hint: a few of the houses will show up in our Row by Row pattern. I’m glad to have found your blog. Your quilt turned out beautifully!